It didn’t take a psychic to tell David Thaler that he’d have a lot of travel in his future, but his work with one did change the way he packs his gear. As the president of Thaler Film, an Emmy Award-winning production company providing video production and distribution services to the broadcast, film, and corporate industries, Thaler’s work requires frequent travel — and transport of his production equipment. And since he often flies solo, he needs to be able to handle this equipment without help. As part of his work producing John Edward Cross Country, a show featuring the renowned psychic, Thaler decided to create a kit suitable for flight that would be easy for him to manage by himself. Known in the industry as a fly pack, David Thaler’s complete multi-camera high-definition mobile studio is capable of shooting an entire television show episode. medium, connecting audience members with their lost loved ones to answer longstanding questions and, hopefully, achieve closure and peace. The footage of the conversations that take place during audience interaction is intercut with reactions from the audience members after the encounter. The overall effect has to be seamless in order to properly convey the powerful emotions that result from Edward’s work. Because of the frequent travel and quick work required to splice the segments together and create a TV-ready episode, the show poses an interesting challenge to a production specialist. “My client wanted a system in place that would meet the Women’s Entertainment network’s high-definition quality standards and also be able to produce low-cost, high-quality road show versions of Edward’s nontelevised readings,” says Thaler. Traveling with television production equipment is no simple matter.Given its bulk and sensitivity, the equipment often has to be ground shipped while the crew flies to the destination, adding time and cost. Thaler, however, knew that the potential convenience of having the equipment “fly along” outweighed the challenges. 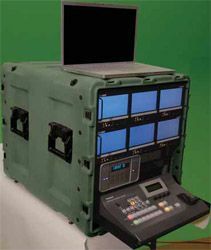 Known in the industry as a fly pack, Thaler’s complete multi-camera, highdefinition mobile studio is capable of shooting an entire television show episode. His kit includes three Canon XH-G1 HD-SDI cameras, a Panasonic AVHS300G multi-format video switcher, an AJA I/O HD ProRes 422 Firewire 800, three Marshall HD-SDI LCD monitors (camera), two Marshall HDSDI LCD monitors (program/preview), a HME wireless intercom system, MacBook Pro and LaCie external hard drive, a Mackie Onyx with Firewire card, Fostex 824 hard disc/DVD recorder, an Adrienne Electronics AEC-uBOX-2, a Denecke timecode generator, a Whirlwind DA-2 for timecode, and a custom camera tally system. With the help of Hardigg Cases, he’s managed to fit it all into three cases that he can handle completely by himself, without skids, palettes, or an entourage of assistants. “It really is the first fly pack that actually flies,” says Thaler, who demonstrated his kit to attendees of the National Association of Broadcasters convention in April 2008.